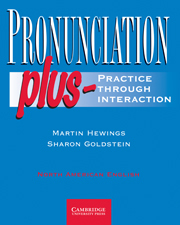 Pronunciation Plus helps intermediate-level students of North American English improve their pronunciation through a variety of stimulating listening and speaking tasks that address all the important topics in English pronunciation: individual speech sounds, sounds in connected speech, stress, rhythm, intonation, and spelling. Nearly half of these tasks are done with a partner or in small groups, giving students opportunities to interact with their classmates while practicing their pronunciation. There is an emphasis on communicative activities that allow students to talk about and explore aspects of everyday life as they learn. The book contains 60 short, manageable units, each one focusing on a discrete topic in pronunciation, such as vowels followed by "r," or pronouncing unstressed syllables. The units can be taught in any order. Get an eSample of Pronunciation Plus that will allow you to view a product preview on your desktop.